Lords win second straight and 33rd overall NCAA Championship. Ladies take second. The Lords extend Kenyon's historic dynasty by winning their 33rd NCAA National Championship while the Ladies clinch second place. Three Kenyon student-athletes earn NCAA Postgraduate Scholarships for athletic and academic excellence. Coach Jess Book '01 and the Kenyon Swimming and Diving team reflect on national championship number 33. Andrew Chevalier '14 wins the 2014 Don Hunsinger Award, the North Coast Athletic Conference's (NCAC) top honor for male student-athletes. Maria Zarka ’16 is taking her diving talents to Glasgow, where she is set to compete in the Commonwealth Games. 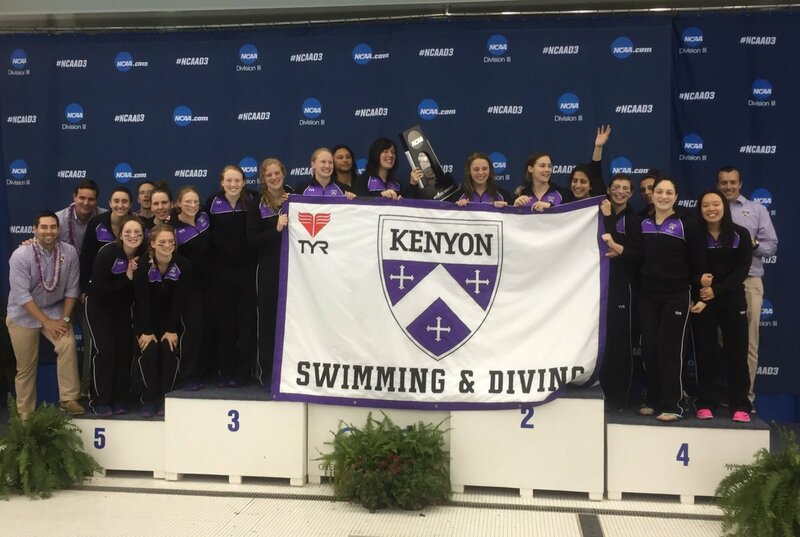 The Lords defend Kenyon's historic dynasty with 34th national swimming and diving championship title. The title-winning Kenyon swimming and diving team used social psychology to its advantage, writes Sarah Lloyd ’17 in Swimming World Magazine. From Gambier to Morocco to D.C., Haley Townsend '16 pursues her interest in Middle Eastern studies. For the 24th time, the women’s swimming and diving team takes home the NCAC championship. Professor of Humanities Tim Shutt has announced every home meet for the Kenyon swimming and diving teams since 1986. Lords and Ladies post second-place finishes at NCAA Division III Swimming and Diving Championships. Julia Wilson ’18 and Hannah Saiz ’13 will compete in the upcoming Olympic Trials in Omaha, Nebraska. From Olympic Trials to a Hall of Fame selection, Kenyon athletes have racked up off-season accolades. Among the 30 athletes selected as finalists for the NCAA's 2016 Woman of the Year award is swimmer Haley Townsend '16. Haley Townsend '16 was honored at an awards dinner in Indianapolis on Sunday as one of nine finalists for the 2016 NCAA Woman of the Year award. The Lords and Ladies seek out top spots at the NCAA III Swimming and Diving Championship. The Lords take second at the NCAA DIII Swimming and Diving Championship while the Ladies place third. Four Kenyon swimmers are recognized as outstanding student athletes by the NCAA. A quartet of Kenyon swimmers win 2017 NCAA Postgraduate Scholarships. Ladies swimmer Ellie Crawford '17 is named a finalist for NCAA Woman of the Year based on her achievements in athletics, academics, leadership and community service.